← I put pea shoots in my cous cous, cous I felt like it. Two of my dear friends came up to visit Philadelphia this past weekend for a mini getaway. They recently got engaged (congrats!) and I hadn’t seen them since their engagement so it was a perfect opportunity to catch up and celebrate the beginnings of their new life together. The weather predicted rain, but we were determined to make the most of the day. We tackled a ton of things on the to-do list which left us not only feeling super accomplished, but also quite exhausted. The next day, the onslaught of rain came and we decided to take this day a bit slower, to meander through parts of the city we hadn’t seen, to eat a decadent breakfast, get food coma, and die from the deliciousness of it. That was the plan. 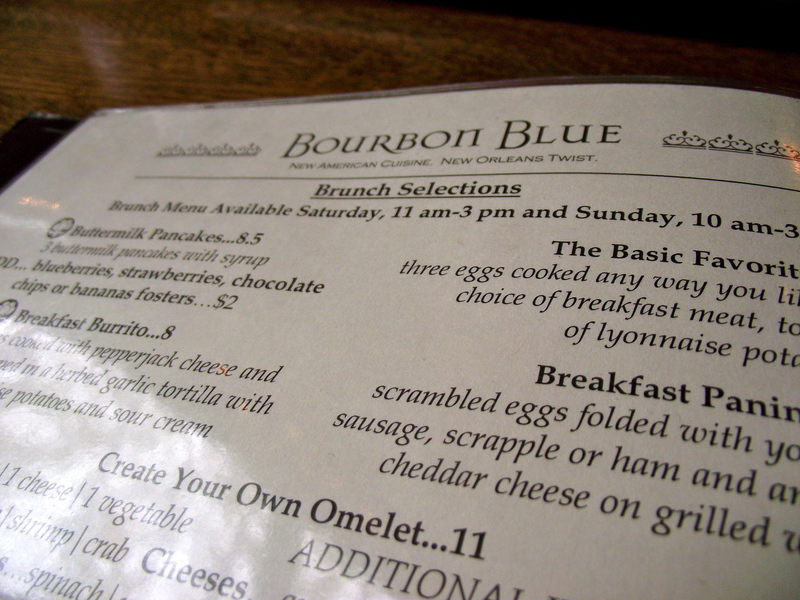 I had heard of Bourbon Blue from a classmate of mine who recommended it while we were having lunch. She introduced me to this wonderful little strip of local eateries and shops in Manayunk, which reminds me so dearly of my beloved Carytown in Richmond, Virginia. It was a joyous find. And I made a mental note. So a few weeks later, here we were, all three of us ready to start our laze-fest. The brunch pretty much did us in. I ordered the crabcake eggs benedict which really combines my top three faves when it comes to breakfast: eggs, eggs, and oh, eggs. Benedict-style is my most favorite fancy shmancy indulgence when it comes to eggs. 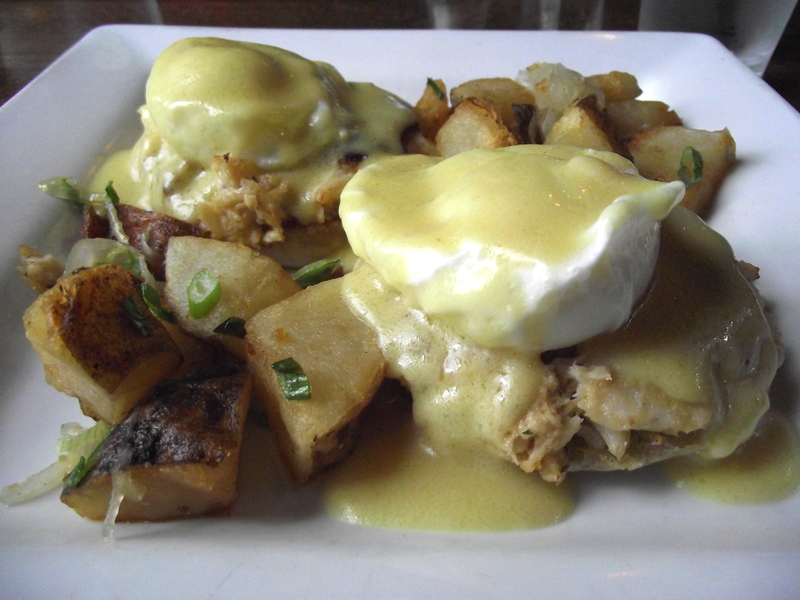 The yolk itself is sinfully creamy enough on its own but that Hollandaise sauce just takes you all the way. I chose the crab cake instead of the (ham?) I think it was? It doesn’t matter. The crab cake was exactly that. Lumps of real crab meat and none of that super bready filling that you can’t even tell if there was crab in there in the first place. The caramelized onions and roasted potatoes mopped up all that extra sauce/yolk/heavenly mixture left on the plate. I did just say mop up the sauce because that’s exactly what you’ll be doing too. Um yeah, I tore it up. A., ever the sweet tooth that she is, chose the French Toast, which, really, made you roll your eyes to the back of your head upon first bite. I usually gravitate to the more savory side of flavors- even when it comes to breakfast but this right here, I could totally do without a second thought. Pillow-y, syrupy-warm, bread. I can’t think of any other words to describe it. 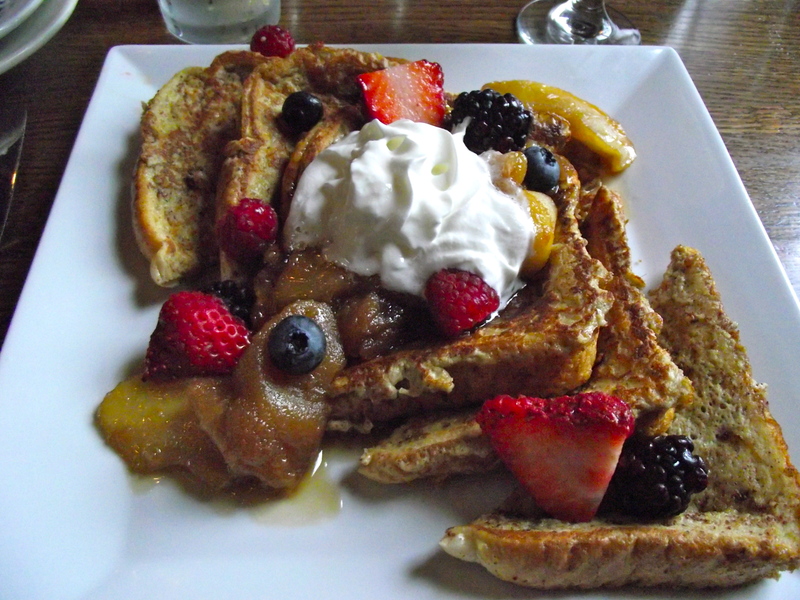 The fresh fruit balanced out the richness of the toast and the baked apples? Forget about it. She tore it up too. In a lady-like manner, of course. 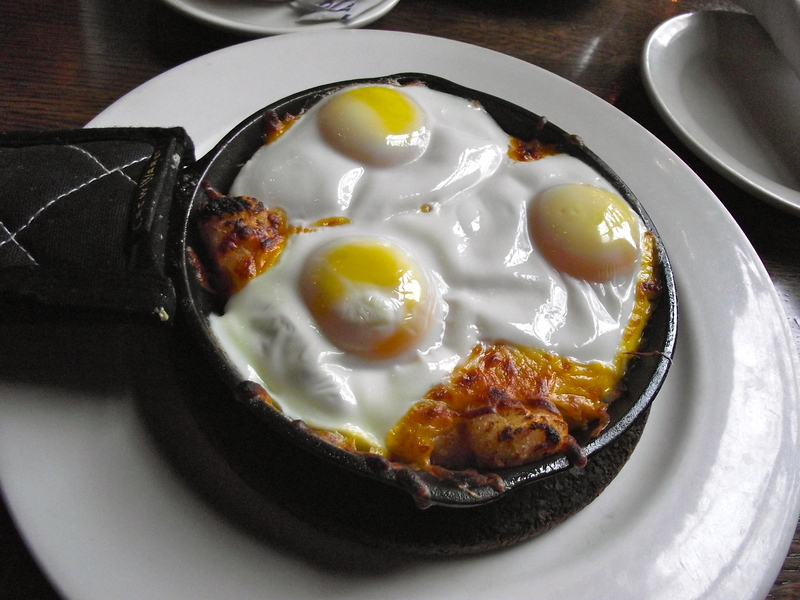 B. chose the Ham Skillet, a heaping layer upon layer of breakfast staples. They combine roasted potatoes, chopped ham, and sharp cheddar cheese in that steaming hot skillet and serve it with, as you see, 3 eggs on top. Where do you even begin? Yum. I had to sneak in a bite of my own before it was all gone. I guess it was just.that.good. And I agree. The melted cheese just melds everything together in this crazy gooey bite and before you know it, you’ve reached the bottom and don’t know how you got there. If you’re in the Manayunk area, I’d check this place out for brunch. I hear the lines get crazy out the door on Sundays but we went early on a Saturday and it was so much more low key. Other than a few couples sitting next to us and a huge baby shower, we had the place to ourselves. Our server was really nice and attentive and they have a gorgeous deck which opens up in the summer. It was a struggle, getting up from our seats, but a struggle well worth it. The rain had let up a bit so we headed down to Kelly Drive by the Schuylkill River to walk it off and take in the last bits of the city before their trip back home. Not so bad for a rainy day, after all. Oh my gad. I want to eat that now! Brunch is the best meal of the day. 😉 I have to come visit you one of these days! That looks fantastic. I grew up in Md. and miss crab cakes! crab cakes are definitely a mouth-watering treat!